Before going ServletContext Example, see the difference between <init-param> and <context-param>, both written in web.xml file. We have seen the above code in Servlet web xml init param Example using ServletConfig where the "portnumber" and "8888" are accessible for the particular servlet "ReadInitParamValues". Other servlets in the container cannot access this data. That is, the <init-param> is accessible to one servlet only or it can be said the <init-param> data is private for a particular servlet. Now is there anyway, the data of <init-param> is accessible to all the servlets under execution in the container? Yes, there exists; we write the <init-param> outside of any <servlet> tag in the same web.xml file. For this, <context-param> (instead of <init-param>) is used as follows. Because the tag <context-param> exists, in the web.xml, outside any servlet tag (say, global area), every servlet can access it. Finally, <init-param> data is local for a particular servlet and context-param data is global for all servlets. This is the difference between <init-param> and <context-param>. 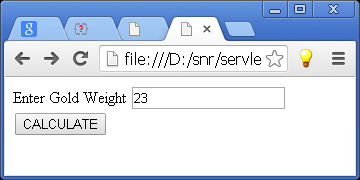 The aim of this program is the servlet reads the weight of gold article from the client HTML file and the gold rate from <context-param> and estimates the bill amount payable. Output screen when submit is clicked after entering gold weight. What you think the Gold rate should be kept as a context parameter? What happened if the gold rate got change? Do we need to restart the application to reflect the new rate? 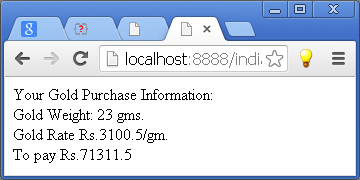 The changed context parameter can be accessed by other servlets even without stopping the server. Are u not getting? though i have not executed the above code. Can you please confirm whether ServletContext object is created through ServletConfig object or directly as the code mentioned in the above example. There is a method in ServletConfig interface getServletContext() which can be used straight away without creating ServletConfig object.